Koch et al. (1990) present data for a multicenter clinical trial testing the efficacy of a respiratory drug in patients with respiratory disease. Within each of two centers, patients were randomly assigned to a placebo (P) or an active (A) treatment. Prior to treatment and at four follow-up visits, patient status was recorded in one of five ordered categories (0=terrible, 1=poor, …, 4=excellent). The following DATA step creates the SAS data set clinical for this study. where t is the baseline (pretreatment) assessment score and a is the patient’s age at baseline. The age range for these data extends from 11 to 68 years. Suppose that the scientific question of interest is the comparison of the two response surfaces at a set of values . In other words, you want to know for which values of the covariates the average response differs significantly between the treatment group and the placebo group. If the set of ages of interest is , then this involves comparisons, a massive multiple testing problem. The large number of comparisons and the fact that the set is chosen somewhat arbitrarily require the application of multiplicity corrections in order to protect the familywise Type I error across the comparisons. When testing hypotheses that have logical restrictions, the power of multiplicity corrected tests can be increased by taking the restrictions into account. Logical restrictions exist, for example, when not all hypotheses in a set can be simultaneously true. Westfall and Tobias (2007) extend the truncated closed testing procedure (TCTP) of Royen (1989) for pairwise comparisons in ANOVA to general contrasts. Their work is also an extension of the S2 method of Shaffer (1986); see also Westfall (1997). These methods are all monotonic in the (unadjusted) p-values of the individual tests, in the sense that if then the multiple test will never retain while rejecting . In terms of multiplicity-adjusted p-values , monotonicity means that if , then . Note that only a single ESTIMATE statement is used. Each of the 105 comparisons is one comparison in the multirow statement. The ADJUST option in the ESTIMATE statement requests multiplicity-adjusted p-values. The extended TCTP method is applied by specifying the STEPDOWN(TYPE=LOGICAL) option to compute step-down-adjusted p-values where logical constraints among the hypotheses are taken into account. The results from the ESTIMATE statement are saved to a data set for subsequent processing. Note also that the response, the average of the ratings at the final two visits, is computed with programming statements in PROC GLIMMIX. Notice that the adjusted p-values (Adjp) are larger than the unadjusted p-values, as expected. Also notice that several comparisons share the same adjusted p-values. This is a result of the monotonicity of the extended TCTP method. Output 43.13.2 shows a comparison of the significant comparisons (p < 0.05) based on unadjusted, adjusted, and step-down (TCTP) adjusted p-values. Clearly, the unadjusted results indicate the most significant results, but without protecting the Type I error rate for the group of tests. The adjusted p-values (filled circles) lead to a much smaller region in which the response surfaces between treatment and placebo are significantly different. The increased power of the TCTP procedure (open circles) over the standard multiplicity adjustment—without sacrificing Type I error protection—can be seen in the considerably larger region covered by the open circles. The outcome variable in this clinical trial is an ordinal rating of patients in categories 0=terrible, 1=poor, 2=fair, 3=good, and 4=excellent. Furthermore, the observations from repeat visits for the same patients are likely correlated. The previous analysis removes the repeated measures aspect by defining efficacy as the average score at the final two visits. These averages are not normally distributed, however. The response surfaces for the two study arms can also be compared based on a model for ordinal data that takes correlation into account through random effects. Keeping with the theme of the previous analysis, the focus here for illustrative purposes is on the final two visits, and the pretreatment assessment score serves as a covariate in the model. The shared random effect of the two observations creates a marginal correlation. Note that the random effects do not depend on category. The combination of DIST=MULTINOMIAL and LINK=CUMLOGIT requests the proportional odds model. The SUBJECT= effect nests patient IDs within centers, because patient IDs in the data set clinical are not unique within centers. (Specifying SUBJECT=ID*CENTER would have the same effect.) The COVTEST statement requests a likelihood ratio test for the significance of the random patient effect. The estimate of the variance component for the random patient effect is substantial (Output 43.13.3), but so is its standard error. The likelihood ratio test provides a better picture of the significance of the variance component. The difference in the –2 log likelihoods is 57.6, highly significant even if one does not apply the Self and Liang (1987) correction that halves the p-value in this instance. The p-values again show the “repeat” pattern corresponding to the monotonicity of the step-down procedure. 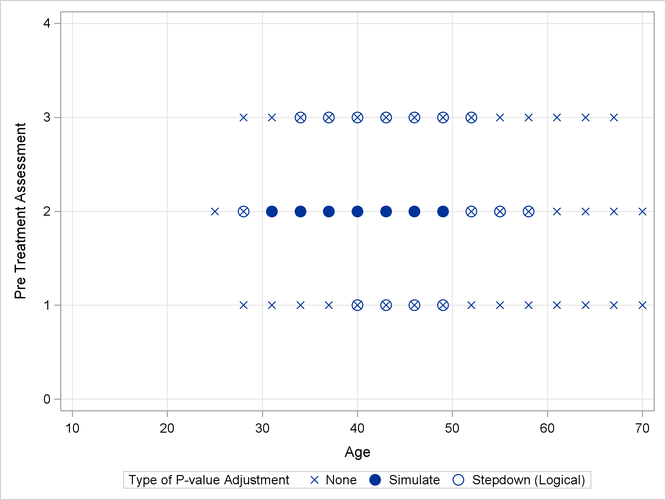 As previously, the comparisons were also performed with standard p-value adjustment via simulation. Output 43.13.5 displays the components of the regressor space in which the response surfaces differ significantly (p < 0.05) between the two treatment arms. As before, the most significant differences occur with unadjusted p-values at the cost of protecting only the individual Type I error rate. The standard multiplicity adjustment has considerably less power than the TCTP adjustment.